I love this recipe for its versatility. I made it blueberry flavoured, but you could easily substitute in another pie filling. I bet lemon or cherry would be just as yummy! It was originally supposed to be a Lemon Crackle Cake, but our grocery store didn’t have any lemon pie filling so blueberry it is! The substitution was fine with me. The base is a blend of crushed soda crackers, brown sugar, flour and coconut. I recommend letting it cool completely so it had a chance to harden and you get that delicious sweet crunch with every bite. 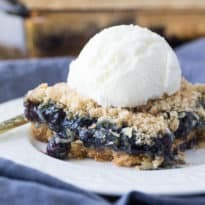 I’m a sucker for anything blueberry so my favourite part was the luscious pie filling. Top with some vanilla ice cream and you have yourself one delectable dessert. No leftovers here! Crackle cakes have been around for a long time and after you try one, it’s easy to see why. They are easy to make and always a surefire hit. Simple and perfectly sweet, this vintage dessert is packed full of so much deliciousness. Add soda crackers, brown sugar, flour and baking soda to a bowl and stir to combine. Mix in butter and coconut. Press 3/4 of the cracker mixture into a greased 8 inch baking pan. Spread blueberry pie filling on top. Cover with the remaining cracker mixture. Bake for 30 minutes. Let cool before serving. What a cake! I want to have a piece right now! This recipe is really easy to make. I am going to make it for a summer dessert and this Blueberry Crackle would be a good recipe for the Holidays! Yum! What a perfect way to use up those summer strawberries! Oh do you think it would hold up well with blackberries? Not sure if they’re too juicy and would make it runny. I think I’ll risk it! I’ve never heard of a cracker cake or had one but I certainly think I would like it and need to try it! Oh my gosh that cake looks amazing. This looks amazing, and it is different than most recipes with the soda crackers and coconut, I’d love to try it! I think it would be gobbled up! Crackle cake or crack cake? Just saying, this looks pretty addciting! I cannot get over how good this looks!! Oh–that looks wonderful…and simple to make! I’m sure the ice cream just puts it over the top! This cake looks so satisfying and delicious! All of my kids love blueberries, this they would surely enjoy. What a great idea – I love blueberries and I’m always looking for a new treat! I’m going to try it with homemade blueberry jam! I made this tonight for dessert and it was a winner! Thanks for sharing the recipe. I bet this is so good with custard! My mom would LOVE this! YUM! 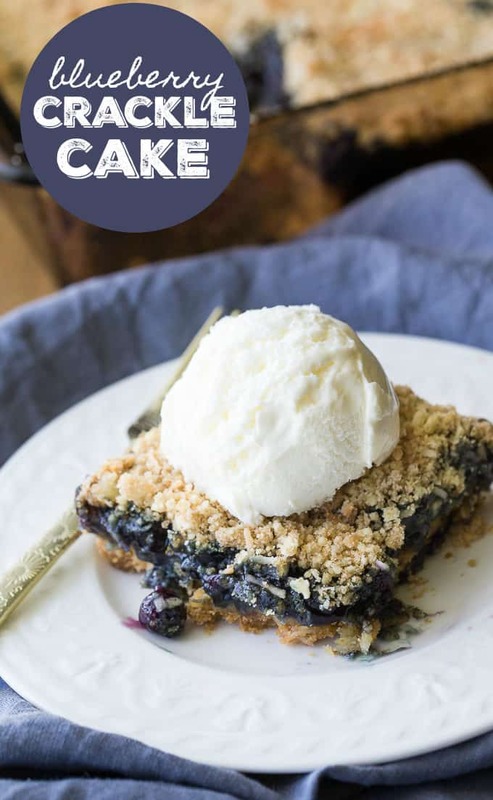 This blueberry crackle cake looks so good. Your recipes always look so pretty. The soda crackers are an interesting twist. I’m anxious to try this recipe. Thank you for sharing at Thursday Favorite Things link party. Shared and pinned. What a great recipe and a delicious dessert, I can’t wait to try this. Thanks so much for sharing with us at Full Plate Thursday and have a fantastic week! This is a work of art! It looks delicious! Pingback: Wine'd Down Wednesday 204 | Dizzy Busy and Hungry! Do you think this should be refrigerated after baking? I’m making it for something tomorrow. just curious.